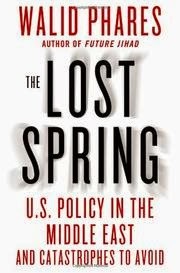 If you have been trying to understand what is going on in the Middle East and the Maghreb (northern African) nations of Tunisia and Libya, among others in the wake of the “Arab Spring” that occurred in 2011, then you must read Walid Phares’ excellent analysis, The Lost Spring: U.S. Policy in the Middle East and Catastrophes to Avoid ($27.00, Palgrave Macmillan). Phares is an expert on the Middle East, terrorism, and Islam. He is a frequent guest on news programs and an advisor to members of Congress and the European Parliament. Like the mythical Casandra who could predict the future, but who no one believed, Phares predicted that a younger, technologically connected generation, along with secular Muslims, were reaching a point where they would no longer accept the oppression of the region’s despots. The “Arab Spring” was ignited in Tunisia, but spread rapidly to Egypt, Libya, and Syria. He documents how, in each case, the Muslim Brotherhood waited for the demands, often of millions of citizens as occurred in Egypt, brought about the removal of men who had ruled for decades. Then, as a well-organized force, took over the revolutions and sought to exert their Islamism, Sharia law, and the same controls against which the people had revolted. What also emerges is the fact that the U.S. sided with the Muslim Brotherhood against the will of the people. Other U.S. policies failures followed, as in the case of Syria. This is the best book you will read about what occurred, why, and what the future may hold. If you are of a political frame of mind, you may want to pick up a copy of The Benghazi Report ($12.95, Skyhorse Publishing) that was produced by the U.S. Senate Select Committee on Intelligence. With an introduction by Roger Stone, a consultant who played a role in the election of Republican presidents from Nixon to George H.W. Bush. “The revelation that the U.S. government has made an affirmative choice not to bring the killers of four Americans to justice is disturbing and unconscionable,” says Stone and many agree. As the event recedes in time and memory, the short report contains the relevant facts. One caveat; Hillary Clinton’s role in the events is never mentioned, nor is she named at any point in the report. In late April we learned that the White House told a complete falsehood, discounting the fact that it was a terrorist attack, calling it spontaneous, and blaming it on a video. 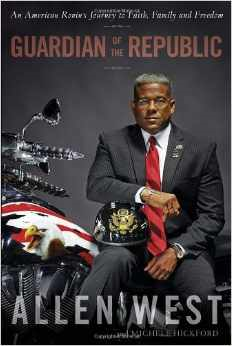 Those who favor conservative politics will thoroughly enjoy Guardian of the Republic by former Congressman, Allen West ($26.00, Crown Forum), a memoir that is also a presentation of the personal views and values that shaped a life devoted to faith, family, and freedom. West earned two master’s degrees, one from Kansas State University in political science and the second from the U.S. Army Command and General Staff College in military arts and sciences. He is a natural born teacher and his book is valuable for its chapters about conservative political thought; its origins and application. An African-American, he rose through the ranks of the U.S. Army to Lt. Colonel, serving in both Iraq and Afghanistan. While much of the African-American community shares a liberal political philosophy, West found purpose and value in conservatism and it took him to a term in Congress as a Representative from Florida. Along the way his experiences and beliefs deepened his views. He is likely to have a real impact on American politics in the years ahead. James Madison was our fourth President, but other than being mentioned among our nation’s Founders, he tends to take a back seat to Washington and Jefferson in the minds of most people, if indeed they even know he exist. 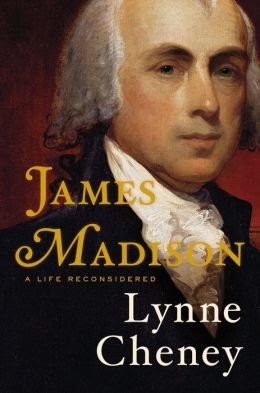 Dr. Lynn Cheney, PhD, a noted scholar, a member of the Commission on the Bicentennial and a senior fellow at the American Enterprise Institute, has gifted us with an extraordinary biography, James Madison: A Life Reconsidered ($36.00, Viking). Madison, though younger than most of the Founders, was recognized by all of them and others with whom he dealt as an extremely gifted intellect. He is generally credited with much of content of the Constitution, most certainly its Bill of Rights. In his day, the idea of a large republic composed of the people’s representatives initially was greeted with skepticism, but he pushed for a strong, but limited federal government to replace the failed Articles of Confederation and respond to the ways the colonies were printing their own money and engaging in practices that harmed other colonies. Dr. Cheney brings him to life, not only with the facts, but with an engaging, entertaining text that provides valuable insights to the times in which he lived. Put this book on your list for summer reading. You will be glad you did. I have always enjoyed books based on a clever idea and that describes Mario Giordano’s 1,000 Feelings for Which There are No Names ($16.00, Penguin Books, softcover). He has captured those moments that we react to emotionally without necessarily being aware of it. They are moments from our lives such as the hesitation before sending an important email and the happiness of fulfilling one of your mother’s lifelong dreams. It’s the kind of book you can open at random although it does have sections of sorts. This is the kind of book you keep around to remind you of life’s many pleasures and fears. We all share them. For the sheer pleasure of reading good writing that spans a wide variety of his experiences, I recommend Christopher Buckley’s But Enough About You, ($27.50, Simon and Schuster), a series of essays, by an esteemed humorist, traveler, and an irreverent historian. He is extremely gifted and as one goes from essay to essay, one is treated to reading his insights, friends such as authors Joseph Heller and Christopher Hitchens, dinner at the Reagan White House, flying a Cessna through Alaskan mountains, working aboard a freighter, gardening, and other topics galore. One is both entertained and enlightened in so many ways that reading Buckley, for aspiring writers, is a lesson in how to observe life and write about it in a superb fashion. Readers are often aspiring writers and, if you have to write as part of your job, you will benefit from How to Write Anything: A Complete Guide by Laura Brown ($35.00, W.W. Norton). It lives up to its title as it teaches how to organize, draft and revise what you write and gets into the differences between academic writing, how to write instructions, and expository writing. Everything from a business letter to a memo, an apology to a speech is discussed. There are rules and there are options. You can learn about all of them in this definitive book on the subject. More and more these days, people are choosing to write memoirs and, for them, there’s Roberta Temes’ How to Write a Memoir in 30 Days ($14.99, Readers Digest, softcover). It offers step-by-step instructions for creating and publishing your personal story. Janell Burley Hofman has authored iRules: What Every Tech-Healthy Family Needs to Know About Selfies, Sexting, Gaming, and Growing Up ($17.99, Rodale, softcover), a particularly useful book for parents who want to teach their sons and daughters about the boundaries and expectations of how to use the many communications technologies that are available to the younger set. It is well worth reading to keep one’s children how to deal with cyber-bullying, and aspects of their lives that should not be instantly shared online and in cyber-space. In a month, a lot of young Americans will be graduating from high school. They are doing so in some very bad economic times that add to the uncertainties that come with the transition. For high school students, figuring out what to do after graduation can be a major question because there are many options. That’s why Undecided: Navigating Life and Learning After School by Genevieve Morgan ($14.99, Zest Books, distributed by Houghton Mifflin, softcover) is just the right book to give a young man or woman at this point in their lives. It helps by putting the decision-making power back where it belongs, with the teens themselves, while exploring the options that are available whether it be a training program, a community college, the military or a four-year university. It provides an in-depth look at what they can expect to earn, what kind of lifestyle to expect, and possible downsides of different scenarios. Being undecided is what being human is all about. Providing a helping hand is a great gift. My youth happily included the movies that starred Roy Rogers and Dale Evans. When the first volume of The Touch of Roy and Dale I was very pleased to read it and revisit those days. A second volume is out and includes many new photos, some 600, along with an excellent text by Tricia Spencer ($21.95, West Quest). In volume II the author draws on 40,000 pieces of fan mail from the Rogers estate, plus new perspective from Roy and Dale’s grandchildren, along with the thoughts of those close to them during their long career. A portion of the sales will go to their Happy Trails Children’s Foundation. They touched the lives of thousands and had a huge fan base. How nice to read about two celebrities whose lives were not touched by the often tawdry things we read about the generation that followed them. Almost fifty years after its release, “You’ve Lost That Lovin’ Feeling” is thirty-fourth on Rolling Stone’s list of the 500 Best Songs of All Time and remains Broadcast Music Inc’s most played song of the twentieth century. It was sung by the Rightous Brothers, Bill Medley and the late Bobby Hatfield. Together they left an indelible impression on the music theirs and succeeding generation loved. 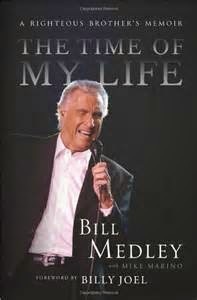 Medley has penned The Time of My Life: A Rightous Brother’s Memoir ($26.99, Da Capo Press) and fans of their music will thoroughly enjoy his account of growing up as the son of musicians in Orange County, California, where he recorded his first solo songs on two tape recorders in his living room. His first paying gig was with a four-piece group, The Paramours, where he met his future partner, Bobby. Together they enjoy enormous success, making more money that two men who were “young, dumb, and full of rum” to know what to do with. They were performing with groups like the Beatles and Rolling Stones, as well as Elvis Presley. After they split up, Medley went onto a successful solo career, but his life was not without tragedy as he tells in the heartbreaking account of his first wife’s brutal and unsolved murder, and his struggle to raise their son Darrin as a single parent. His second marriage is in its 27th year. The memoir is enhanced by a foreword by Billy Joel. Medley was inducted into the Rock and Roll Hall of Fame in 2003 and continues to tour and perform. War always generates memoirs and a particularly moving one is by the late Max Gendelman, A Tale of Two Soldiers, ($14.95, Two Harbors Press, softcover) and begins on December 18, 1944 when the then 12-year-old soldier was captured by the Germans during the Battle of the Bulge. A Jew, he had more reason to fear for his life than other prisoners. While imprisoned, though, he met Karl Kirschner, a lieutenant in the German Luftwaffe. It turned out that both had a passion for chess and, in time, they decided that both, captor and prisoner, would escape the prison camp! Their friendship would last sixty years and transcended the bigotry of the times they shared. It is a story of courage, faith, and honor. Gendelman returned home, married and started a family and a successful business. In 1952 he helped his friend come to the United States. He died in June 2012 and was buried with military honors. One of the most dramatic incidents of World War II was the torpedoing of the USS Indianapolis on July 30, 1945 as it made its way to a small island in the South Pacific, sailing unescorted after delivering uranium to be used in the first atomic bombs. Told that the waters were safe, Edgar Harrell and several other Marines were sacked out on deck when six torpedoes sank the ship, leaving him and other survivors in the ocean for five horrifying days, until those not killed by sharks, were picked up. The story of his courage, ingenuity and faith is told in Out of the Depths ($16.99, Bethany House Publishers). Mike Huckabee, former Governor of Arkansas and TV personality, said, “There aren’t too many times when the word ‘hero’ is appropriately used. Heroes are people who do extraordinary things and in the service of others, Edgar Harrell is a true American hero.” One of the tragedies of World War II was the refusal of the U.S. government that on May 13, 1939 that denied entry to the MS St. Louis, sailing from Hamburg, Germany, and filled with Jews seeking to escape the Nazi government. Among those on board were the grandfather and uncle of Martin Goldsmith and they and the other passengers were returned to Europe where many were sent to concentration camps where they died. In Alex’s Wake, ($25.99, Da Capo Press), he details his six-week quest to retrace their journey to assuage the guilt he carried for living happily in America despite his family’s tormented history. The book is more than just his and his family’s, but one that many experienced, including Germans who regretted the horror the Nazis inflicted on Jews and others. It is 75 years since that event and a reminder that America only entered World War II after being attacked by Japan. The Nazis were defeated, but not before they killed millions, among whom were the victims on the MS St. Louis. A memoir by the mother of Tim Burroway, Losing Tim, ($14.95, Think Piece Publishing, softcover) is dedicated to him, “Captain, Ranger, Paratrooper, husband, father, hunter contractor for humanitarian mine removal in Iraq, Republican, romantic, idealist, perfectionist, gun nut, my first born, my baby.” After serving in the U.S. Army, Tim became a private contractor, essentially undertaking the same jobs as those in service, but without many of the benefits. How big a role do they play? A large number of those serving the nation in Afghanistan are private contractors, but according to a recent RAND survey, many return home with mental health issues at a higher rate than the soldiers and there are 22 suicides a day in the veteran population. Janet Burroway has authored fifteen books for adults and three for children. The journey that Tim took was one from a defender of America to one deeply disappointed by both the origin and outcome of the war in Iraq to depose Saddam Hussein. As she notes, one in three returns from our war zones with a mental disorder and the life Tim imagined and then lived was filled with disappointment despite his commitment to it. Some lives are just filled with too much tragedy, but Tim was fortunate to have a mother who could relate the facts of his life. The power of our minds and the way it exerts that power over our lives always makes for interesting reading and, in many cases, useful insight. One of the problems that have increasingly come to public attention has been autism, an affliction that parents notice early on. 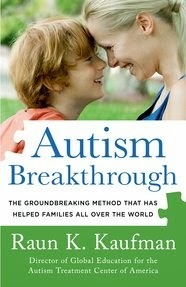 The diagnosis often is devastating, but Autism Breakthrough: The Groundbreaking Method that Has Helped Families All Over the World by Raun K. Kaufman ($25.99, St. Martin’s Press) will come as very good news for those families dealing with it. Kaufman is the director of global education for the Autism Treatment Center of America. He is living proof autism can be treated and overcome. He shares the groundbreaking principles and strategies that helped him and offers new hope through a scientifically proven roadmap that helps autistic children overcome it. His parents literally turned all the recommended cures on their head and chose to work with him instead of against the symptoms he displayed, building a bridge to his world. The book is an accessible, step-by-step guide. For those who like to explore the scientific side of things, there’s Mental Biology: The New Science of How the Brain and Mind Relate by W.R. Klemm ($19.95, Prometheus Books, softcover.) The author focuses on how the mind emerges from nerve-impulse patterns in the densely-packed neural circuits that make up most of the brain, suggesting that the conscious mind can be seen as a sort of neural-activity-based avatar. As an identity in its own right, the mind on a conscious level can have significant independent action, shaping the brain that sustains it through its plans, goals, interests, and interactions with the world. He also delves into the role of dream sleep in both animals and humans, and explains the brain-based differences between non-conscious, unconscious, and conscious minds. Dr. Klemm has written extensively on this subject. Can love and anger co-exist? Yes say the authors of Riding the Passionate Edge: Converting Tension into Emotional Intimacy, ($15.95, Langdon Street Press, softcover). In an intimate relationship it is a common error to believe that emotional closeness and tension can’t co-exist. Mary and Tom Cushman provide concrete skills for transforming relationships, even those that may feel beyond repair, into those that recapture the original feelings that drew two people together. They make a powerful case for engaging tension directly and skillfully through empathetic listening, straight talk, compassion and forgiveness to heal the damage caused by unresolved emotional wounds. The authors are a married pair of long-time counselors, having been clergy and teachers, who for the past 16 years have been private practice counselors. Another book that can prove helpful is Be Real: Because Fake is Exhausting by Rick Bezet (19.99, Baker Books), the pastor of New Life Church in Arkansas. “God makes it simple for us,” says Bezert. “Being fake is exhausting, and it drains us and eventually kills our body and our soul. But being real requires us to put God first in our lives and to allow his love to overflow into every area of our lives. Our hope in him is real.” Well, I did say he was a pastor, but he is also an engaging author who knows that the world is full of fakers and even some who attend church every Sunday can be included among them. His book is a call to readers to live a life based on authenticity. For those with a healthy spiritual life, this book will prove supportive and instructive. The greatest gift for any child is the enjoyment of reading, so get them started early. 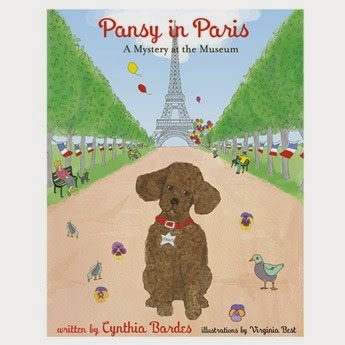 A new addition to her series is Cynthia Bardes’ Pansy in Paris: A Mystery at the Museum ($18.95, Octobre Press), illustrated by Virginia Best. Her previous book was “Pansy at the Palace: A Beverly Hills Mystery.” In this one Pansy, a poodle and Avery, a little girl who adopted her, solve who is stealing paintings with a story that will surely entertain those to whom it is read or old enough to read it for themselves. It is told from Pansy’s point of view and this large format book with full page artwork is just delightful. The same age group, from 2 and up, will enjoy A Bee Named Bea by Candace A. Dietz with illustrations by Virginia J. Rost ($14.95, Mixed Media Memoirs), a collection of poems about various animals such as a cow that can’t stop mooing or a lonely bee that everyone is afraid of. Each poem ends with a cheerful resolution. The book has twenty poem-stories to keep young minds engaged. Some books for the very young with the intention to teach important life lessons and A Simple Idea to Empower Kids by Kathleen Boucher ($13.95, Balboa Press) offers three principles to young readers age 3 to 12, about the power of love, choice and belief to help them develop self-confidence and deal with whatever comes their way in life. Parents will find this book very helpful to get a child off to a good start. Miss You Like Crazy by Pamela Hall and illustrated by Jennifer A. Bell ($15.99, Tanglewood) is written for those ages 6 to 8 and is a story that reminds children that, even when parents are away at work, they are always thinking about them. It is a lighthearted way to reassure children of their importance in their parent’s busy lives. Also from Tanglewood is Audrey Penn’s A Kissing Hand for Chester Raccoon ($7.99) for the even young set, ages 2 to 4. It is now a board book, made study enough to withstand all manner of handling. This book is becoming a children’s classic, having already touched the lives of many readers who benefit from Mrs. Raccoon’s secret for making a child feel safe and secure. 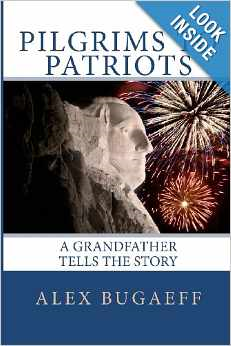 For the younger set, pre-teens, there is an excellent book based on American history, Pilgrims to Patriots: A Grandfather Tells the Story by Alex Bugaeff ($24.95, print, $8.99 Ebook, Create Space) that, in fact, the older reader will enjoy as well. A grandfather shares his knowledge of the years that led up to the American Revolution and brings to life the nation's founders as real, living men, along with a host of other characters from our early years such as Molly Pitcher, a cannoneer, and events like the War of Jenkins' Ear, to Elizabeth Key, the slave who sued the Virginia Colony for her freedom. It is both educational and very entertaining. The book's value is enhanced by the need to impart such knowledge to a younger generation that is not receiving it sufficiently in our schools. Pre-teens and teens benefit from reading novels that overcome today’s “tweet” reduction of everything to 140 characters. Cara Bertrand begins her “Sentantia” series with a fantasy story, Lost in Thought ($19.95/$11.95, Luminis Books, hard and softcover) about Lainey who everyone thinks has severe migraines from stress and exhaustion. In truth, Lainey, age 16, has visions of how people died or are going to die, a secret she keeps to herself. Doctors advise she be enrolled in a private New England boarding school to help cure her, but while there is no cure, she discovers that everyone at Northbrook Academy has a secret too where half the students and nearly all the staff are members of Sententia, a hidden society of the psychically gifted. This paranormal theme, along with a bit of romance, and lots of action-packed twists to the plot will keep any young reader turning the pages. Don’t Call Me Baby by Gwendolyn Heasley ($9.99, HarperTeen, softcover) will gain the author even more readers, especially if they have read her two previous young adult readers. It’s about the daughter, a teenager, whose Mommy Blogger has no concept of boundaries, having been writing about her since before she was born, telling everything about her on the popular blog. At age 15, Imogene has been protesting to no avail. When a mandatory school project requires her to start her own blog, she is reluctant to expose any more of her life online until she realizes that the project is an opportunity to define herself for the first time on her own terms and to give her mother a taste of her own medicine! This is a story that is heartfelt and often laugh-out-loud, sure to please the girls for whom it is written. Spring for the publishing world is—as is the autumn—the time they roll out many new books and, when it comes to novels, it would appear that fiction still has a large audience to satisfy. You can’t write novels unless you have an active imagination and Anna Godbersen surely does. She already has two bestsellers, “The Luxe” and “Bright Young Things”. 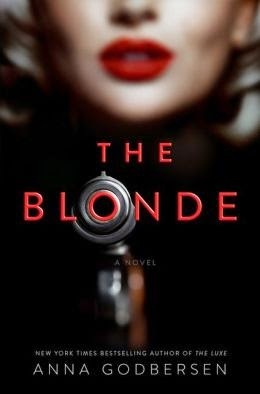 Having come of age when Marilyn Monroe was the quintessential superstar, I must confess the theme of her new novel, The Blonde, ($26.00, Weinstein Books, a member of the Perseus Books Group) was a bit off-putting, but that will surely not be the case for most others younger than myself. In this book, Godbersen conjures up a Marilyn Monroe who, through the help of a mysterious stranger, rises from being the young, unknown Norma Jeane Baker with aspirations of being an actress to the famed movie star twelve years later. Her benefactor, however, is a member of the then-Soviet KGB and she is told to find something about John F. Kennedy that they can use in some fashion. Instead of aiding the KGB she falls in love with him and, when she learns of plans to assassinate him, she must escape her Soviet handlers to save him and herself. The novel incorporates the Hollywood of her era, the murderous intrigue, and the elements of a well-known actual history. Together they become a novel that makes for a great read and is likely to end up a film at some point. Intrigue and murder from an earlier era, that found in Sir Arthur Conan Doyle’s novels, is found in The Conan Doyle Notes: The Secret of Jack the Ripper by Diane Gilbert Madsen ($28.95, MX Publishing, London, available via Amazon.com). The publisher is the world’s largest specialist in books featuring the most famous fictional detective, Sherlock Holmes. Steve Emecz, the MX managing director, says “There has never been a better time to be a Sherlock Holmes fan” he is thrilled to have her novel. “It’s perfect for a fan base with an appetite for modern thrillers with a link back to Conan Doyle.” Her novel involves a wealthy Chicago lumber baron’s diary which reveals that Doyle left some valuable handwritten notes during his 1894 visit to Chicago. They contain vital information about the Ripper murders. When the diary is stolen, D.D. McGil, an academic turned insurance investigator, comes upon information she believes confirms the identity of Jack the Ripper and finds herself a target in a deadly game to locate a literary find that could rewrite history. In Monday, Monday Elizabeth Cook tells the story of a tragedy in Texas that changes the course of three lives ($26.00, Sarah Crichton Books). Based on an actual incident when, in August 1966, Charles Whitman hauled a footlocker of guns to the top of the University of Texas tower and began firing on pedestrians below. He killed sixteen people and wounded thirty-two. It was the first mass shooting of civilians on a campus in American history. The novels follows three students caught up in the massacre, Shelly who walks into the path of the bullets and two cousins, Wyatt and Jack, who heroically rush from their classrooms to help the victims. On that day a relationship begins that entangles them in a forbidden love affair, an illicit pregnancy, and a vow of secrecy that will span forty years. Reunited decades after the tragedy, they will be forced to confront the event that changed their lives and that has silently and persistently ruled the lives of their children. At its core, it is the story of a woman determined to make peace with herself, with the people she loves, and with a history that will not let her go. 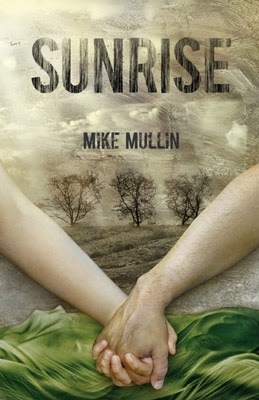 A very different story is told by Mike Mullen in Book 3 of the “Ashfall Trilogy”, Sunrise, ($17.99, Tanglewood). It takes place after the Yellowstone super-volcano has nearly wiped out the human race. It is now almost a year after the eruption and the survivors seem determined to finish the job as communities wage war on each other, gangs of cannibals roam the countryside, and what little government survived has completely collapsed. Sickness, cold, and starvation are the survivor’s constant companions. The debut novel “Ashfall” in 2011 was a big hit as was Book 2, “Ashen Winter” in 2012. No doubt Book 3 will enjoy a similar acclaim as it is a triumph of imagination as Mullen takes on the task of writing about a world of survivors must overcome the horrendous outcome of the eruption. It addresses questions of responsibility, and bravery, civilization, and society. Though written as a young adult novel, I think older readers will enjoy it as well. A number of softcover novels provide some entertaining as well. We have entered an era in which anyone who wants to write a novel can get it published. Jeff Turner has had a long, successful career as a college professor with more than twenty college-level textbooks to his credit and he draws on his experience in academia and life to have written The Way Back ($14.95, Page Publishing). It is about a college professor who is at the top of his game, living a posh live in a Connecticut shoreline town, whose world is turned upside down when he faces trumped up charges of academic harassment. In the midst of that crisis he discovers his wife has been unfaithful and that his son is being bullied by high school thugs. If that isn’t enough, a seductive and mysterious woman enters his life, along with troubling memories of an incident from a family swimming pool party that went horribly wrong. He and his family must cope with uncertainty and upheaval. It is the story of the emotional frailty that can strike anyone without warning and how his family must deal with the family’s inner demons. This is a novel that demands to be read from cover to cover because it is going to be hard to put down. A very different story is told by Lynne Raimondo in Dante’s Poison, a novel, featuring a blind psychiatrist, Mark Angelotti, who is helping Hallie Sanchez defend her oldest friend against murder charges. A muckraking journalist, Rory Gallagher, has died from a fatal dose of Lucitrol, a powerful antipsychotic drug and suspicion immediately falls on his longtime lover, Jane Barrett, who has just defended the drug’s manufacturer against product-liability claims. Mark and Hallie succeed in obtaining Barrett’s release, only to discover that Gallagher’s killer may still be on the loose and targeting them as his next victims. Angelotti was in Raimondo’s novel, “Dante’s Wood.” The author formerly was a general counsel for Arthur Anderson and later the Illinois Department of Revenue. Her background, combined with her talent, combine for a new novel that anyone who enjoys such intrigue and danger will enjoy. In J.T. Prescott’s thriller, Arts and Crafts, ($16.95, Two Harbors Press) a former covert operative. Ken Frazier, is looking forward to retirement after leaving the clandestine world behind is sought out by a former colleague, George Larson, and confronted with outrageous claims about a government conspiracy that includes major U.S. cities falling prey to snipers. Hesitant to believe the claims, he is suddenly thrust back into action when Larson shows up dead and the rumors turn out to be true. This is a fast-paced adventure, filled with conspiracy and murder, as Frazier’s experience and instincts kick in and he recruits the help of two members of his former team. Together they band together for one last desperate mission. In a somewhat similar theme, Johnny Shaw tells a story in Plaster City ($14.95, Thomas and Mercer) of Jimmy Veeder who is enjoying life as a farmer and family man with occasional breaks to act as wingman to his best friend’s booze-fueled misadventures. When Bobby Maves teenage daughter does missing, Jimmy will be along for the rescue mission and what begins as a bad situation turns into something else entirely involving a violent turf war between a fierce motorcycle gang and a powerful crime lord, fighting it out on a desolate strip of desert known as Plaster City in the landscape of the California-Mexico borderland. Shaw’s previous novels received awards and his long career as a screenwriter and novelist demonstrate his skills. That’s it for May! Tell your friends, family and coworkers who enjoy reading about Bookviews.com so they too any get the latest word about new fiction and non-fiction. And come back next month for more!